Diffusers for TPL Vision’s LED illuminations. 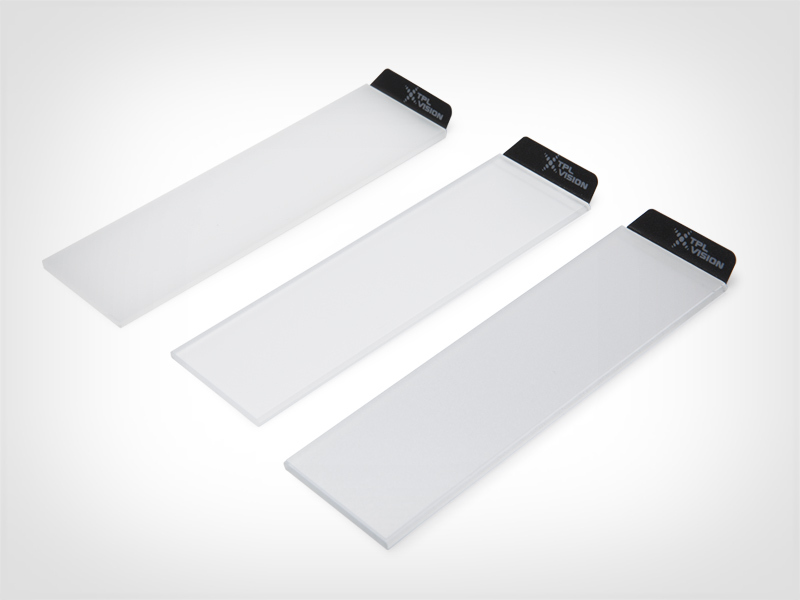 The Transparent Diffuser (DT) aims to protect the lighting and to ensure a better lifespan. It is anti-scratch treated and 50 times more resistant than glass. The led lighting power is not degraded in any way. The Opaque Diffuser (DO) transforms the lighting power in a diffuse homogeneous lighting. All backlights by TPL Vision are equipped with an opaque diffuser, essential for shadow puppet effect. The Satin Diffuser (DS) enables the close lighting of a workpiece, without any hot spots and reduces shiny effects. Besides, most UV lightings are equipped with satin diffuser, for a better UV rays transmission. By default, the EBAR+ and the LBAR are delivered with transparent diffusers, the BLBAR+ with an opaque diffuser. You can also order more diffusers separately. However, all diffusers are not compliant with all products (see technical sheets).